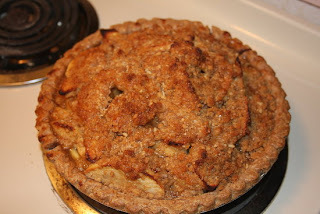 I began to peruse Cooking Light’s website for a suitable pie recipe. I’ve found tons of dinner recipes on Cooking Light so I consider them a reliable source. I’ve only made one fruit pie in my life (blueberry), and it was only “alright” but not spectacular, so I was a little scared. I finally chose this recipe. 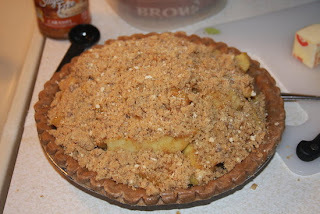 I had high hopes for this pie, and let me tell you, my expectations were exceeded! I also had a lot of fun taking these pics with the camera I “stole” from my dad. It’s a Cannon EOS 40D. I want one, now. I can’t wait to borrow it again. Begin with a bunch of these. Chop, chop, peel, peel. Fun, right? It’s worth it I swear. This pie crust is one of the best discoveries at Whole Foods, EVER. Seriously, you should check it out. Now it’s time to make the scrumptious crumb topping. 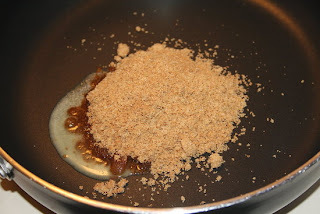 Before adding the crumb topping drizzle on some caramel sauce. Homemade, store-bought, whatever you desire. Bake at 375 degrees, for 30 minutes (mine baked for 35). 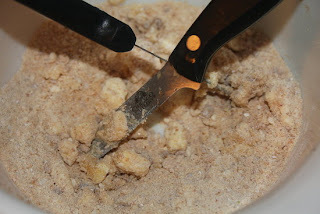 To prepare crust, lightly spoon 1 cup flour into a dry measuring cup; level with a knife. Combine 1 cup flour and salt in a bowl; cut in 2 tablespoons butter and shortening with a pastry blender or 2 knives until mixture resembles coarse meal. Sprinkle surface with ice water, 1 tablespoon at a time; add vinegar. Toss with a fork until moist and crumbly (do not form a ball). Press mixture gently into a 4-inch circle on heavy-duty plastic wrap; cover with additional plastic wrap. Roll dough, still covered, to a 12-inch circle. 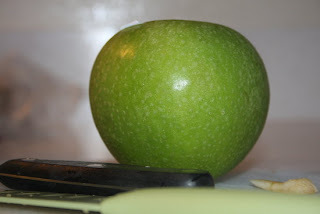 Freeze 10 minutes or until plastic wrap can be easily removed. 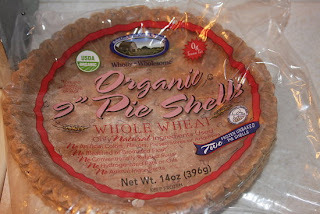 Remove 1 sheet of plastic wrap; fit dough into a 9-inch pie plate coated with cooking spray. Remove top sheet of plastic wrap. Fold edges under; flute. Line bottom of dough with a piece of foil; arrange pie weights (or dried beans) on foil. Bake at 375° for 15 minutes or until the edge is lightly browned. Remove pie weights and foil; cool on a wire rack. 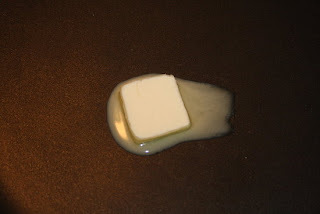 To prepare filling, melt 1 tablespoon butter in a large nonstick skillet over medium-high heat. Combine 1/2 cup brown sugar and cinnamon. 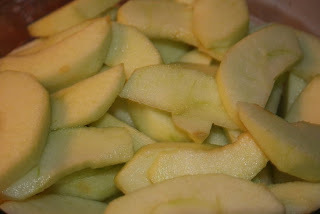 Add sugar mixture and apples to skillet; cook 5 minutes, stirring occasionally. Remove from heat; stir in 3 tablespoons flour and lemon juice. Spoon into prepared crust. To prepare topping, lightly spoon 1/4 cup flour into a dry measuring cup; level with a knife. Combine flour and 1/4 cup brown sugar in a bowl; cut in 2 tablespoons butter with a pastry blender or 2 knives until mixture resembles coarse meal. 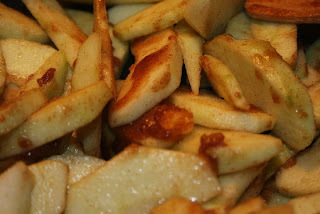 Drizzle syrup over apple mixture; sprinkle topping over syrup. 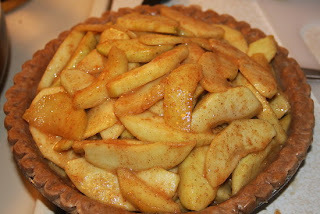 Bake at 375° for 30 minutes or until apples are tender. Cool on a wire rack. Thank you for sharing this recipe. I used this as a guide and created my own spin, it was WONDERFUL!